Enjoyable, smartly directed sci-fi comedy that will probably split the diehard fans down the middle but is certain to win some new ones along the way. Since its debut in 1978, Douglas Adams’ The Hitchhiker’s Guide to the Galaxy has been a BBC radio series, a “trilogy” of five books, a TV series, a website and a computer game, so it’s surprising how long it has taken to reach the big screen. Martin Freeman (Tim from The Office) stars as Arthur Dent, a spectacularly ordinary man having a decidedly bad day. No sooner has he discovered that his friend Ford Prefect (Mos Def) is in fact an alien from a planet in the vicinity of Betelgeuse, than the Earth itself is unexpectedly destroyed in order to make way for an intergalactic by-pass. If you’re a die-hard Hitchhiker’s fan and you’ve been waiting 27 years to see this movie then don’t panic, because they haven’t messed it up. Perhaps the biggest change from the other adaptations is the foregrounding of the romance between Arthur and Trillian. However, this actually works - it gives the film a proper structure and it also just about excuses some of the more obviously annoying deviations, most of which involve Zaphod. Martin Freeman is perfectly cast as Arthur Dent and Zooey Deschanel is rather brilliant (not to mention drop-dead gorgeous) as Trillian. She even manages to fit in yet another shower scene - she seems to be making a habit of unexpected shower scenes in vaguely inappropriate movies, what with Elf and now this. Mos Def is extremely good as Ford (particularly in the amount of uses he finds for his ever-present towel) and Bill Nighy is superb as planet designer Slartibartfast. The only let-down is Sam Rockwell, who gives a messy, irritating performance as Zaphod which seems entirely wrong for someone who’s meant to be the coolest man in the universe. Also, the concept behind his second head has been badly thought-out and doesn’t really work, though the lemon-powered ‘Thinking Cap’ is a stroke of genius. The only other real disappointments are the Vogons (who are not nearly as funny as in the TV series), elements of the ending and Rickman’s decidedly lacklustre vocal performance as Marvin, which is a shame, because otherwise, Rickman is perfect casting. 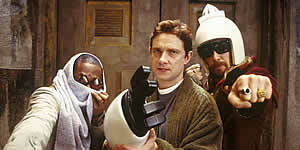 There are lots of really lovely tributes and cameos scattered throughout the film, including Simon Jones (the original Arthur) as the Magrathea answering machine hologram ("Your imminent deaths may be recorded for training purposes"), Douglas Adams's face as one of the Improbability formations and the original Marvin robot in the queue on Vogsphere, as well as the inspired use of the original music as the 'theme' for the Guide. In short, it’s somewhat churlish to complain that the film is ‘different’ from the book, TV show or radio series because they’re all significantly different from each other anyway - the important thing is that the film stands alone. As such, it succeeds admirably, despite the odd flaw. Highly recommended then, and make sure you don’t leave during the closing credits or you’ll miss a classic Guide entry.